On Sunday, August 19, the Lizzadro Museum holds a Fossil Collecting Field Trip for the whole family to enjoy. (Please note that children must be ages eight and over.) You’ll meet at the museum at 8 a.m. for the motor coach ride to Mulford Quarry in Rockford. 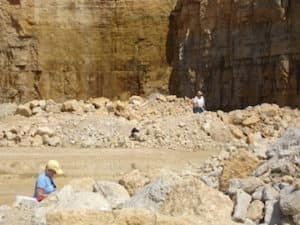 Blasting at the limestone quarry recently revealed newly uncovered marine fossils you can collect and take home. All of us at Elmhurst Toyota think it’s great to live near locations that show what our area was like in prehistoric times. We encourage you and your family to attend this fun, educational field trip. Much of the Northern Hemisphere was under the ocean during the Ordovician Period, the era of the fossils that you can collect on the field trip. The dolomitic limestone in Mulford Quarry shows many layers of fossil marine life. You may find the fossilized remains of brachiopods, which resembled modern-day clams, and cephalopods, which looked like octopus or squid. Ancient corals look like the corals living in oceans today. Crinoids were lovely, delicate-looking animals similar to modern-day feather stars and sea lilies. Ancient gastropods were related to today’s sea snails and slugs. There may be other types of Ordovician Period fossils to collect at Mulford Quarry during the Fossil Collecting Field Trip. The Lizzadro Museum in Elmhurst regularly holds earth science education-related trips and programs for the public. This is in addition to the museum’s large collection of gemstones, carvings and cameos, fossils, rocks and minerals. You don’t want to miss Lizzadro Museum’s Fossil Collecting Field Trip. Reservations are required, so make yours today! Sunday, August 19, 2018, 8 a.m. to 2:00 p.m.
Meet at Lizzadro Museum to board the motor coach. Admission is $40 for museum members and $45 for non-members. Call 630-833-1616, email info@lizzadromuseum.org, or visit the website at www.lizzadromuseum.org.